Live a Colorful Life: Oh, the places you can GO! Look what showed up on my doorstep last week! SO excited about this little GO!baby by AccuQuilt. It claims to be very easy to use. I decided an assistant would helpful in testing this claim. This fabric cutter is fabulous. Charlotte was happy to go through my stash and she chose lots of pinks. What nearly 5-year-old girl doesn't like pink, right? She tested out each of the three die sets that came with the GO!baby. I showed her one time how the cutter worked and then she was on her own (with my supervision, of course). This fabric was one of her favorites. Aren't the little scooters cute? The GO!baby is so easy to operate that you can actually multi-task. My assistant already knows how to multi-task. She could turn the handle and watch Tangled at the same time. The dies I chose were three sizes of hexagons, a parallelogram, and small tumbler. I have some cool ideas for each of them. And there could very well be a chance to win one of these Go!baby cutters of your very own, so stay tuned. 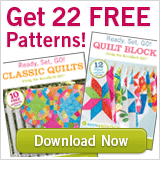 In the meantime, just sign up for AccuQuilt emails and you can get 22 patterns for free. I know this picture was already at the beginning of the post. But don't you love how my assistant dressed in colors that coordinate with the quilts shown in the pattern download? On the other hand, it could be that I just wanted to show off my beautiful assistant again. How exciting! Your assistant is definitely adorable and I can tell that she already has your great sense of color! Why are my 'assistants' not so helpful? Oh, yeah - I don't have a GO!!! So fun!! I'm so glad you got your hands on one of these fun little guys :) Can't wait to see what you stitch up! Ah-ha I tried to get one, but I'm not big enough!! I wonder how do you cut hexagons without making waste? When I cut by hand there is no waste. ps. wish I had an assistant!! This should definitely make cutting out those hexagons easier! Oh! I am so jealous! Do you need another assistant? I can't believe you succumbed to getting a gadget to cut your fabrics too! Looks like you're having fun playing and putting it to good use. Enjoy! Lol! Glad to hear you're enjoying your new toy! Darling assistant! We are up at Bass Lake and having a ball! So, what prompted you to dive into the Accuquilt world? I see everyone excited about it, so it must be Fun Stuff, but I'll be interested to see if you feel it makes the process go faster. Oh, you are so lucky! I want one of those. I keep entering giveaways, too, but no luck yet. I think my little assistant would have fun helping me, too. Yours is just adorable!